To avoid unfairness, the individual prisoners where I worked were treated the same. They all wore the same uniform, were served the same daily meals, and were subject to the same rules. No inmate was singled out. It’s easy to feel like little more than a number while imprisoned. What we see as fair or unequal may not be the way Jesus sees it. We often feel superior to others. We want to be ahead in sports and in life. We may think we’re better than whole groups and discriminate against them. Jesus’ scales of justice are different. He turns our ideas upside down. In His parable of the workers in the vineyard, Jesus tells how the men who had come to work earlier grumbled and thought they should be paid more. Have you ever thought you were treated unfairly? Have you compared yourself to those around you? If you feel inferior (or superior) for any reason, remember that Jesus loves you for who you are. You are more than a number, and He will lavish His love on you in particular. Look to Him, not to those around you. 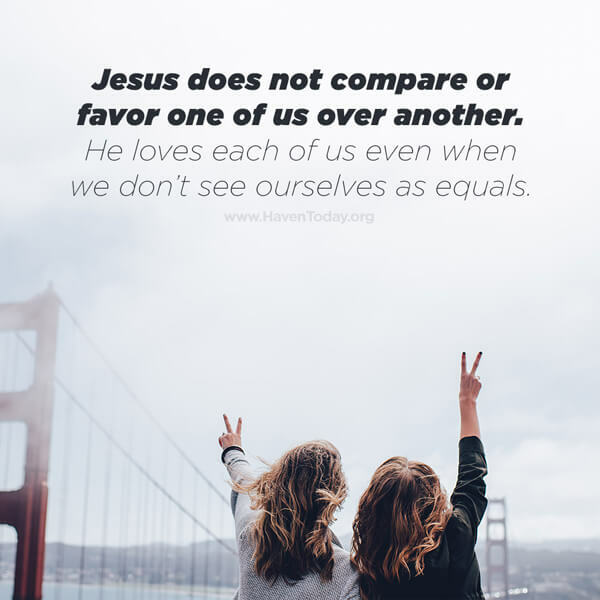 Jesus does not compare or favor one of us over another. He loves each of us even when we don’t see ourselves as equals.